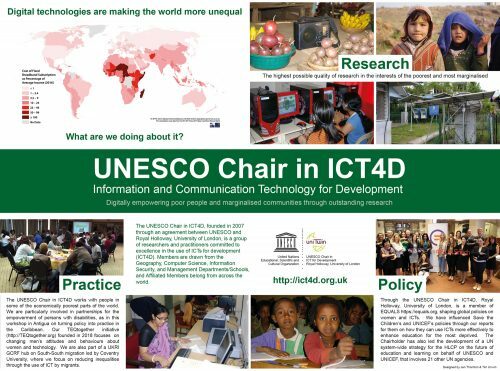 The UNESCO Chair in ICT4D grew out of the ICT4D Collective which was created in 2004 as a group of people committed to undertaking the highest possible quality of research in the field of ICT4D, and making the results of this available freely to the global community. We did this primarily in the interests of poor people and marginalised communities, wherever they may be found. Membership of the Collective implied adherence to a basic set of Principles for the ICT4D Collective that had been agreed amongst its members. These emphasised in particular the principles of collaboration, openness, mutual respect, multi-disciplinarity and partnership. Above all, it sought to be a collective grounded in the shared interests of its members, which is something very far removed from many of the hierarchical academic structures that currently prevail.